A badly damaged or decayed tooth is dangerous, not to mention very painful and can become severely infected weakening the immune system. This can be prevented or detected early with regular cleanings and checkups. Teeth are tough on the outside, but inside they have a soft core called a nerve chamber. This inner core is made up of nerve tissue and blood vessels that feed the nerve. Serious irritation of the nerve can be caused by deep decay, having a deep filling as a result of that decay, or an injury to the tooth. 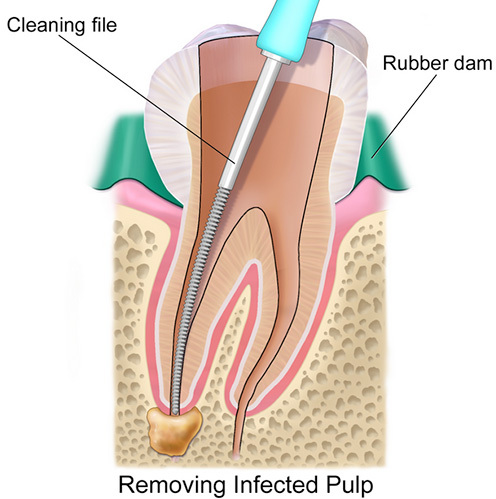 Once this occurs the pulp then becomes infected, begins to break down, and bacteria multiplies within the pulp chamber, and can even extend through the root tip and begin to eat away at the surrounding bone (this is an abscess.) During a root canal procedure, the nerve and pulp are removed and the inside of the tooth is cleaned and sealed. There are some misconceptions that root canals are painful but usually the discomfort associated with the procedure is about the same as having a cavity filled.